When one walks in a parking lot, one may assume that he or she is just making a short, uninvolved trip back to the car before heading home. The unfortunate reality is that many types of accidents can happen in that short walk from the store or restaurant to one's car. A property owner may fail to maintain a parking lot and create dangers that can cause severe injuries to the public relating to falls and unsafe conditions. Rosenfeld Injury Lawyers LLC represents people injured in slip and fall accidents in Chicagoland parking lots. Our attorneys are committed to fully prosecuting your parking lot injury case against the property owner, management company, snow removal company or others who may have control of the premises. Contact our office today for a free review of your case. Business owners have a legal responsibility to maintain safe parking lots for customers. Business owners must be sure to diligently uphold this duty by performing regular maintenance work on parking lots, checking for dangerous conditions on the parking lot and ensuring it is clean at all times. They must also provide necessary additions to the parking lot, such as proper lighting or security in dangerous areas. Major companies like CVS, Walgreens, Target, Walmart and other stores all have a legal duty to provide a safe parking lot atmosphere to customers. If a store attempts to evade this responsibility, then one should seek the help of a lawyer immediately. Even if these corporations are leading the property from a commercial landlord, they likely still have a duty to maintain the property in a safe condition for customers. Courts have held that even where a contract states that the corporation does not need to perform maintenance work, that the business may still be liable where customers are injured due to dangerous conditions on the property. All too often, major corporations are more interested in profitability than in ensuring the safety of customers. It is crucial for customers to send the message that this behavior is unacceptable under the law by actually holding them accountable under the law. Chicago parking lot accident lawyers are available to help you with your case. The duty of care owed by a business can be extensive. 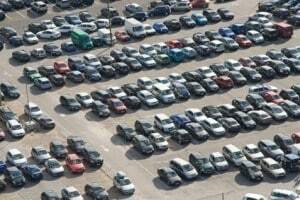 Upon leasing property, the company may need to provide many additions to ensure that the parking lot is safe. These additions may entail hiring security personnel, providing a new lighting system in the parking lot or placing signs in different areas to warn of dangerous areas on the parking lot. If a business has failed to meet this duty of care under the law, then customers may have a cause of action for negligence against the company. In addition to proving that the business had a duty of care and failed to meet their responsibility, a personal injury lawyer must prove that the victim suffered measurable damages caused by a parking lot accident. The lawyer must also show that the breach of the duty of care is causally connected to the injuries that one has suffered in the parking lot accident. Tripping on an open pothole or icy condition in a parking lot could cause a permanent disability. One may suffer from a severe head injury if he or she is involved in an assault that takes place in the parking lot and could have been prevented with security measures. These injuries are severe, and customers deserve to have their claims recognized under Illinois law. How do building codes impact trip and fall cases? Are homeowners to blame for falls on their property? Can I file a lawsuit against a business where I fell? Do I need a lawyer to represent me in a trip and fall case?